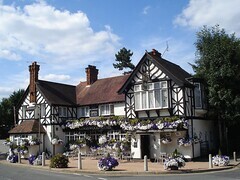 Upmarket pub in the Surrey village of Kingswood, very handy for Kingswood Station and originally the Station Hotel. Previously owned by Enterprise Inns, it was bought by Fuller's in early 2012. A prominent sign on the door bars entry to those wearing "untidy workwear", noting that the dress code is "smart casual". The interior is all nooks and crannies, traditional pub decoration and when the weather permits, a roaring open fire. The bar frequently has dishes of mini cheddars, olives and cheddar cubes set out on it. There's a separate restaurant section. On Kake's August 2013 visit there were five Fuller's ales on: London Pride, Summer Ale (£1.90/half), HSB, Chiswick, and the seasonal Sticky Wicket. There were a couple of other customers in, and music was playing quietly. Like other Fuller's pubs, they have free wifi via O2 (registration required). Accessibility: A step to get in. Once you're in, it's step-free to the ladies' (not sure about gents'). Some of the seating is up more steps. Last visited by Kake, August 2013. Opening hours taken from sign outside pub, August 2013. Last edited 2013-08-22 16:48:31 (version 6; diff). List all versions. Page last edited 2013-08-22 16:48:31 (version 6).